I've driven to Dennison, Ohio 2 times now & tomorrow will make 3 -- it's about a 2 hr drive from Columbus. 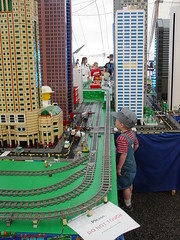 The TrainFestival is in full swing. Seen a few people from work there... Every time I turned around, people were complimenting us on our display. I'm glad it turned out so nice, despite the rain.